You are here: Home / Recipes / Dinner / Nine Pepper Soup Recipe! 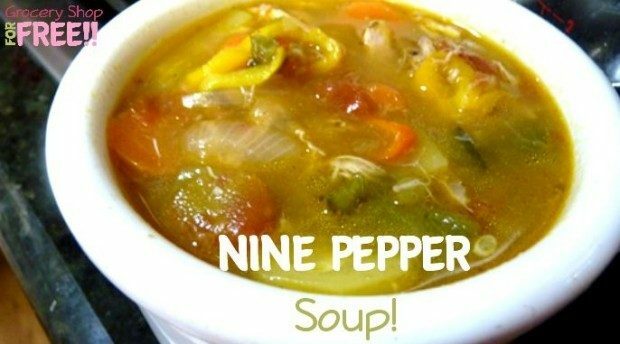 Susan is back with another great recipe – Nine Pepper Soup! I am not a spicy eater, living in Texas that is hard for sure. But, Susan promises this won’t be too hot, so maybe I’ll give it a go! I promise that this Nine Pepper Soup is not as hot as it sounds. I didn’t intend to put so many peppers in it, really, it just sort of happened. My goal was a good vegetable and chicken soup, so, I opened the refrigerator and started pulling stuff out, chopping stuff up, and, I was not disappointed. I threw a little cheese and some tortilla strips on top and I had the best tasting tortilla soup.